For former Andhra Pradesh chief minister Nara Chandrababu Naidu, the best thing about losing an election is the free time one gets to relax and plan for the next battle. That next battle may be a long way ahead, but Naidu does not regret having lost the election after ruling the state for nearly 10 years. These days Naidu�spends time reading about current affairs and how India can move ahead. "Defeat for me is an opportunity," says the Telugu Desam Party chief who spends considerable time on the internet to learn how technology can be better deployed for the benefit of the poor. 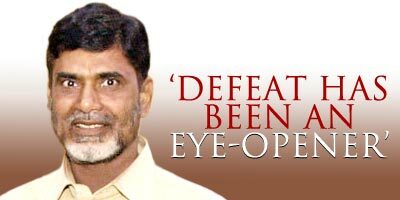 Ever since the shock defeat in the state assembly election in May, Naidu who cultivated the image of a CEO, has been analysing what went wrong. Was it bad governance or wrong policy decisions? Wasn't making Hyderabad a hot IT destination the right decision? Didn't he take care of the farmers and the villages? Rarely has Naidu opened up his mind in the past six months on why he lost the election. In an exclusive interview to Deputy Managing Editor George Iype, he spells out why he was defeated and what he plans to do now. It is almost six months since you lost the election. Have you done any assessment of what went wrong? There are so many reasons as to why we lost the election. We have thoroughly analysed the reasons. One of the main reasons was the severe drought that gripped Andhra Pradesh last year. Then I think we went wrong in the timing of the election. We thought January and February were the best months to hold elections. But the Election Commissioner postponed it to May. Ultimately, when the election took place in summer, people misunderstood us. Can the people be blamed? No. We are not blaming the people. We wanted to create a new work culture for the government in Andhra Pradesh. But some of the employees did not like it. Moreover, there was a false propaganda that my government was going to reduce the retirement age of�government employees. Then the anti-incumbency factor worked against me. But don't you think your alliance with the BJP also did not work out well? That is also something we have very thoroughly analysed. Yes, I agree that the communal riots in Gujarat had a very negative impact on us in Andhra Pradesh. In 1999, all the minorities in the state voted for us. In 2004, none of them voted for us. In that sense, the alliance with the BJP was a bad decision? Yes, the alliance with the BJP was also one of the reasons that led to our defeat. But that is not the main reason. We had nine years in government. Anti-incumbency was there. We were complacent. Our party simply thought we would win the elections. I should tell you that�extremist groups like the Naxalites also worked against us. Would you agree that the Congress's election strategy was much better than yours? The Congress won the election on false promises. The Congress has promised the people that they can have everything free. They said they would write off all the dues and loans, promised free power and so many things. When people heard these dream promises, they simply opted for a change. You have been admired as the most efficient and practical chief ministers India has ever had. But hasn't this defeat been a shock and an eye-opener to you? It has not been a shock. It has been an eye-opener. Today, I am happy that it was me who put Hyderabad and Andhra Pradesh on the international map. If foreign investors and IT companies are queuing up in Hyderabad, it is because of the hard work and vision of my government. I am not at all worried that the election has gone wrong. I am continuously analysing what went wrong and preparing the party cadres for the political battles ahead. Defeat for me is an opportunity. Generally, when there is a debacle, people get worried. But I do not get disheartened in defeat. I want to take this crisis, this defeat as an opportunity. I want to rebuild the party. I want to inculcate values in the party and create an efficient leadership. Do you think one issue that defeated you was the call for the separate state of Telengana? The Telengana issue has not worked against us. But the point is that too many forces joined together in the name of Telengana to fight against us. During election campaigning, the Congress and the TRS promised in high rhetoric that Telengana was just coming. People naturally believed that Telengana was on the way. But where is Telengana now? What happens to the Telengana issue? Now that they have come to power in the name of Telengana, they may not do anything. They would keep quiet on the separate statehood issue till they lose power. That is the politics the Congress and TRS have played on Telengana. Has the TRS too reduced its rhetoric for Telengana? TRS is�also not talking about it these days. Look at TRS leader Chandrashekhar Rao. He is a Cabinet minister without any portfolio. If he could not get a portfolio in the last six months, how can he get�separate statehood of Telengana? The Congress and the TRS have cheated the public on the Telengana issue. You made Hyderabad an international destination especially for IT companies and foreign investment. But your critics say you have not taken this development to the villages of Andhra Pradesh. No, that is not correct. I am very clear about my perception of development. If you want to develop a state, you have to make its main cities a showpiece. Hyderabad is the capital of Andhra Pradesh. Naturally, when a foreign investor is coming, if I ask them to go to Warangal, Tirupati or Vijayawada, they may not go. So for the key sectors like information technology, biotechnology, healthcare and various outsourcing services, we had to develop Hyderabad. Then from Hyderabad, we were taking and spreading development to other areas of Andhra Pradesh. We developed Hyderabad, and the neighbouring areas in districts like Ranga Reddy, Medak and Nalgonda also got automatic progress. But the most important fact is that it is not just Hyderabad that I have developed. I have spent all the money in the villages on health, education, power, irrigation and infrastructure. I have constructed 50,000 school buildings. I have launched so many water schemes. But the misery of the people is bigger than our support. So naturally,�people think�the government is doing nothing for them. Also, unfortunately, the severe drought that hit the state damaged all my good work in the villages. You managed to rope in big companies like Microsoft and GE to Hyderabad. Do you think the IT boom is continuing in Andhra Pradesh? Sadly, not at all. The Congress government is going negative on making Hyderabad a global destination for IT companies. There is competition all over the world. Indian cities and states are competing for foreign investment by giving land and infrastructure to companies. I brought in companies like GE and Microsoft to Hyderabad. In GE alone, 6,000 employees are working now. Do you think the government can give jobs to 6,000 people? The government does not have the money and work for new employees. The IT companies that I brought to Andhra Pradesh have brought in nearly 3,00,000 jobs. You said the Reddy government is going negative. Yes, this government is going negative. The government is now trying to investigate and enquire into the IT projects that I executed. Let them do that. I have no worries. But sadly, all the IT companies want to leave Hyderabad because of the harassment being meted out by the Congress government. No investor has any faith in this government. All new investors are going to Chennai, Pune or Bangalore. Why is it that farmers are continuing to commit suicide in Andhra Pradesh? Do you know that from January to May this year, when I was in power, there were only 24 suicides? After the Congress government came in, there have been around 1800 farmer suicides. The Congress promised the moon to the farmers, but is unable to execute anything. One of the main reasons why farmers are committing suicide is because of the sympathetic money that the government is giving to the victims' families. The government is providing Rs 2 lakh to the family members of the suicide victim. This government is supporting suicides. How is it being in the opposition after a long stint? Wherever I am, I have to do my duty. I am preparing my party these days. I have got lots of time to talk to the people. I read a lot and analyse issues. You get time to relax also? Not just relax. Generally I am a person who works very hard. I get up at 4 am. But I get more time to do my favourite exercises like yoga, breathing and [using the] treadmill. How do you assess the Manmohan Singh government? This government is going very slow. Sometimes they are giving wrong signals on foreign investment and reforms. India has the capability to grow at the rate of 10 per cent. Anything minus means the government is not doing the right job. India is a big market with excellent human resource. India is capable of producing results. Manmohan Singh is not giving able leadership and direction. He lacks the drive and motivation that an Indian prime minister should possess.